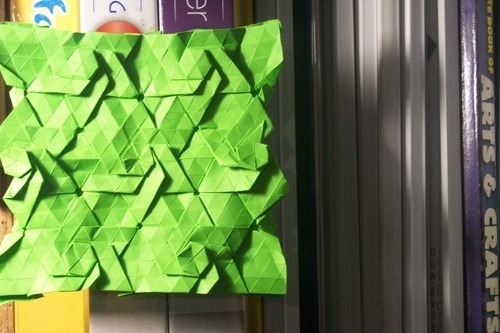 Although it is in the book, I do not think this can be called a tessellation since an origami tessellation can be a repeating pattern (like the normal ones we see everyday) or the ones that we call “recursive (the same model design appears in a smaller scale in the middle and so on, like the Hydrangea). Such characteristics cannot be seen in this model. 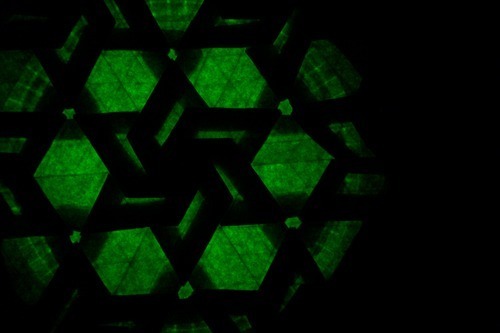 Then why is the snowflake/flower-like thing in the Origami Tessellations book? Well, it is because this model can be tilled to form an appropriate tessellation. (Note: the hydrangea can also be tilled, but a single unit can already be considered as a tessellation itself). 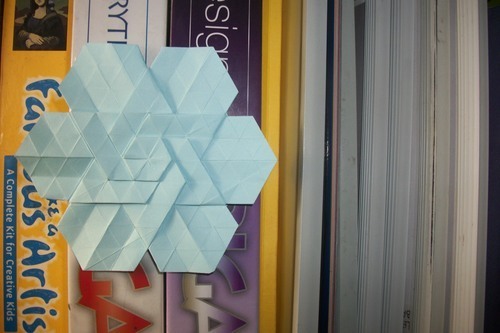 So, if you have only folded the snowflake-like one (the light blue one), then you did not fold the tessellation itself. It’s why it is labelled as intermediate in the book; tilling the model can be hard work unless you know the right technique. The model is composed of hexagon twists, 60-degree pleat intersections, and 120-degree pleat intersections arranged to form a star with a spiral-like thing in the middle. Note: Eric Gjerde was able to tell a hint on how to tile the model in the book.